This video shows how the ocean's garbage patches formed. Aaah, the ocean. The true final frontier. Full of wonderful and exciting things, such as strange fish, stranger crustaceans, beautiful hydrothermal vents, and lovely, ever-growing garbage patches. Due to the rotation on the Earth, ocean currents tend to form five gyres. While the term can refer to any type of vortex in air or sea, it is most commonly used in oceanography to refer to immense circular structures of ever-churning water. All the stuff we dump into the ocean is picked up by the current, and eventually end up in one of the gyres, and the portion that does not degrade gets to stay there for a while. And that is why they’re often believed to be floating islands of trash (some false estimates would have them bigger than Texas). In reality, plastic does get degraded up to a point by the Sun, so the waters around the gyres are more similar to very thick soups, filled with waste the size of confetti pieces. This ‘microplastic’ waste is literally strewn all across our ocean, from the surface to the depths below, but in those five areas around the world there’s way more of the waste than usual, and these are known as the Earth’s ‘garbage patches’. But how did these areas form? The team over at NASA’s Scientific Visualisation Studio has collected 35 years of the NOAA data, and represented it in the handy video below, which shows how ocean currents have carried plastic waste to five specific gyres. The research is based on hundreds of data-collecting buoys released by the NOAA over the past four decades – represented here as white dots – and it creates a pretty mesmerising but terrifying picture of just how far waste travels. 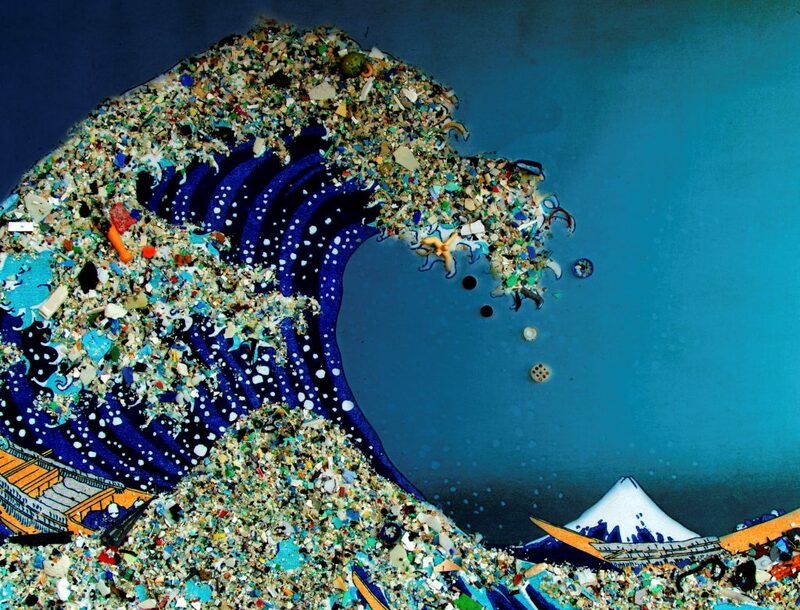 It also shows why garbage naturally gravitates together and forms these large concentrations of plastic waste. New technology is being developed to clear our wold’s waters. But new technology is sometimes difficult and almost always expensive to implement. The easiest way to fix this is for each and every one of us to become aware and take action. So the next time you decide not to recycle plastic, or glass, or even a tin can, just remember those white dots. Some fish will wear your soda bottle as a hat. Forever.